Tis the season for all things shopping. Let me ask you a question. How many time have you purchased a Christmas present for a family member, only to find out that a few months later it’s forgotten? This tends to happen a lot with kids. Susie gets her sights set on some Disney Princess doll and incessantly asks for it. When she finally unwraps it Christmas morning she plays with it for a couple of weeks and finally forgets about it. Don’t let this happen to you! What if I told you there was a gift you could get for your family that will keep giving back for years. What if I told you this gift could help you make memories and bring you closer as a family. This gift that I’m talking about is an RV. Now, before you start thinking about how expensive an RV is let me explain why Christmas is a great time to buy and how our team here at Moore’s RV can ensure you get a great deal on your RV purchase. Off Season This is the off season for RV dealers, which means you can get thousands of dollars off of the MSRP of your RV. Whether you’re looking for a travel trailer, fifth wheel, or camper we can help you find a great RV that will serve your family. Low Gas Prices Gas prices are at an all time low for a lot of the country. When you’re planning an RV vacation gas is typically your highest expense. Take advantage of low gas prices and our huge selection of incredibly lightweight RVs. These RVs are so light that many can be towed by mini vans, small SUVs, and even the family car. That means that even if gas prices go up, you won’t have to worry about purchasing a gas guzzling truck to pull your RV. RV Vacations Are Affordable Despite gas being the most expensive part of an RV vacation, they’re still up to 40% cheaper than traditional vacation. Plus, you don’t have to worry about losing luggage, delayed or cancelled flights, renting a car, eating out, and checking in and out of hotels. Financing How about taking your Christmas budget and putting it toward a down payment on your RV and financing the rest through our RV finance department. We’ll help make sure you get a great low interest rate (*depending on your qualifications) and that your monthly payment is manageable. 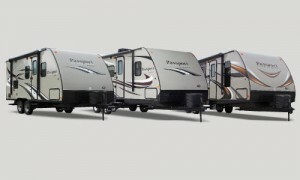 We are proud to offer the Keystone Cougar, Cougar X-Lite, Hideout, Passport Ultra-Lite, Aspen Trail, Kodiak, and Viking.